REGISTRATION IS NOW OPEN for the 5th annual Sun Valley Forum - July 23-26, 2019, at the new Argyros Performing Arts Center in Ketchum! 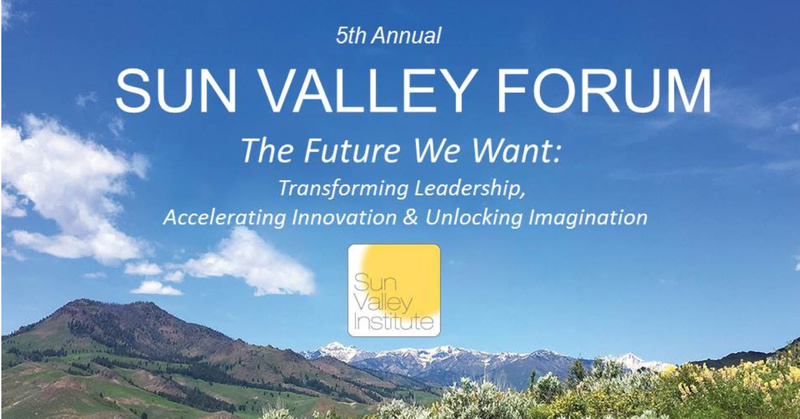 Each year, the Sun Valley Forum gathers leaders and innovators from government, business, nonprofits, investment, and academia to share strategies, broaden thinking, and ignite new partnerships at this groundbreaking event with a goal of building greater resilience. Environmental shifts and economic interdependence, as well as social and political upheavals, call for proactive leadership to build resilient communities, companies, nations, and economies. To have success at scale and urgency, we must address the interconnections and pursue strategies that serve multiple benefits: To that end, the Sun Valley Forum includes a diverse set of topics and approaches, from energy and food, to equity and human resilience, and from policy and investment to technology and communications. LEARN MORE & REGISTER HERE. This year, we are excited to introduce the inaugural Claiming our Future: Youth Action for a Resilient World for high-school age students. This Youth Forum will parallel the Sun Valley Institute’s annual Forum schedule with interactions among our two communities of change makers to benefit all. Youth Forum applications are due May 1. Click here to learn more here.